A few weeks ago, I created a project from their fast2fuse double-sided fusible. I love the product. It was immediately evident why they called it fast2fuse. Dang. It is fast to fuse. It's a thick fusible, but not quite as intense as Pellon's Peltex. - Find a round object around the house: a glass, a jar lid, the cap from your hairspray, etc. 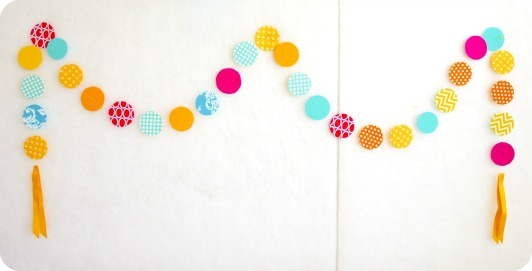 - Cut strips of fabric a quarter to a half an inch wider than your round object. - Lay your strips out wrong side up and put the double-sided fusible on top of it; then lay more strips right side up on top of the fusible. 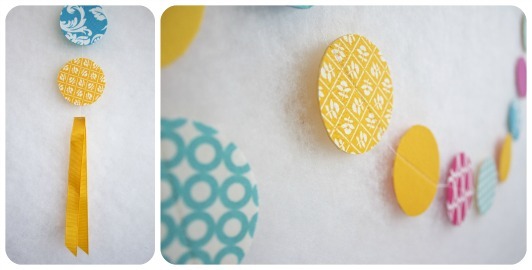 - Fuse on both sides with your hot iron, trace circles, and cut them out. - At the sewing machine, fold some ribbon in half and backstitch in the fold. - Then start sewing a chain. 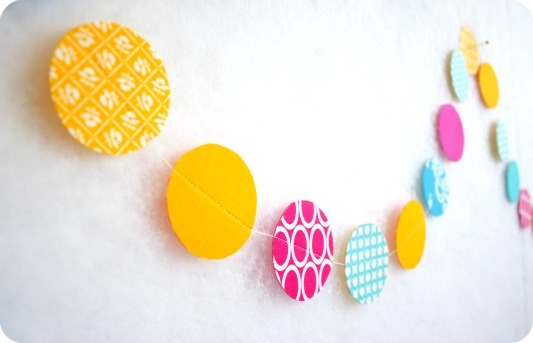 At even intervals, sew through the middle of a circle. - When you run out of circles, sew into another length of folded ribbon. Shazam. It will go even faster if you can get some help cutting circles. I've got to go pull a quilt out of the dryer. Pictures tomorrow! Neat, I have some fast2fuse as yet unused, now I have something to do with it! Thanks. How fun!!! :) So bright and cheery!